If you are looking for the perfect romantic getaway, you can stop searching as the place you have been dreaming about is Vanity Golf Hotel in Majorca. This adults-only hotel, located in the Port of Alcudia is ready to offer you an unforgettable holiday for two with spectacular suites, a natural environment, activities for couples and incredible cuisine. The exceptional cuisine at Vanity Golf makes it one of the best choices for couples spending their holidays in Majorca. 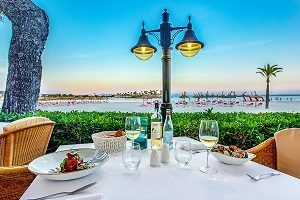 The Adagio restaurant is a cosy and well-lit place which offers breakfast and dinner buffets, whereas the Mirablau restaurant offers the possibility of lunch and dinner. For lunch, we recommend one of the exquisitely prepared rice dishes and for dinner, maybe some of our fresh grilled dishes for an enjoyable seaside dining experience for two. Hotel Vanity Golf provides incredible suites with all the amenities for a well-deserved holiday for two. Although all its accommodation options are fantastic, the Royal Terrace is the absolute paradise for two. This suite has a private terrace, a Balinese bed, two loungers and amazing views of the Mediterranean. Excellence and comfort will highlight your romantic getaway when you stay at Vanity Golf. In addition to the spectacular suites and exquisite cuisine, you can take part in a variety of activities for couples on your romantic getaway to Majorca. As Gian Luigi Epis notes, “it depends on the particular couple as each one has a different hobby; for example, in addition to the fitness centre, you can go sailing, go horseback riding, visit a winery, explore the Sa Bassa Blanca Museum and of course, play golf on some of the best golf courses in Mallorca, located only 4 minutes from the hotel.” In addition, there are guided hiking routes each week throughout Majorca which include transportation. The best part of the ideal Mallorca holidays for two is without a doubt, the spectacular natural environment that surrounds Vanity Golf. This adults-only hotel, located in the Port of Alcudia, is a place of residence for poets and writers with the beautiful Alcudia Bay as its backdrop. The direct beach access from the hotel allows you to go for romantic walks along the beach for a 10 kilometre stretch. It is an absolutely charming environment that is ideal for an unforgettable romantic getaway.